I did not have to go far to find this peppery little plant – I picked it from between the paving slabs in my back garden and then sprinkled it on my lunch. Hairy bittercress thrives in freshly disturbed ground, and is therefore most common in well weeded gardens, under orchards and in coppiced woodland. As a result it is the bane of many gardeners – search for it in google and you will be presented with many ways to ‘eradicate’ this weed which ‘infests’ your garden. However, as with many other plants, what is a bane for gardeners is often a boon for foragers: whilst much effort is expended by some trying to deter it, I can’t think of a more convenient place for this delicious leaf to grow than in a garden. It is able to withstand the harshest frosts; I have picked large bunches of it from frozen ground just after the plant itself has thawed and it was still edible. Although it is around for most of the year bittercress is more noticeable in the winter months when it is not crowded out by other plants. The tenacious nature of bittercress which makes it so difficult for gardeners to get rid of means that once it is established in an area you can pick it quite freely without damaging a future harvest. To pick it I find scissors are best – snip it where the leaves all join the top of the root so the rosette stays together. If you cut too high you will have to pick up lots of individual leaves, and if you cut too low you will damage the root for next time. As long as a few plants are allowed to flower and go to seed it will keep on returning each year, as each plant is capable of producing an incredible 700 – 5,000 seeds each. The little seed pods can explode when touched, spreading the seeds quite a distance for such a small plant. The pods (called siliques) split apart on either side leaving a thin membrane in the middle – a characteristic feature of the cabbage family. Another thing to look out for in members of this family is a flower with four petals containing 6 stamens – 4 tall and 2 short, although you will need a hand lens or magnifying glass to see this on bittercress. Leaves of the cabbage family also give off a distinctive mustardy and/or cabbagey smell when rubbed. Two close relatives of hairy bittercress are lady’s smock (Cardamine pratensis) and large bittercress (Cardamine amara), which are more common along streams and have a strong horseradish taste. The leaves of the hairy variety do indeed have hairs although you may not notice them at first. They can be seen with a hand lens or try looking closely at the photo I took (click to enlarge). Bittercress has a more mustardy flavour and is wonderful in salads. By breaking up the rosettes the tiny leaves can be used to make an interesting decoration to most dishes. As with all plants containing mustard oils there is not much point cooking bittercress, as the mustard flavour dissipates through heating. 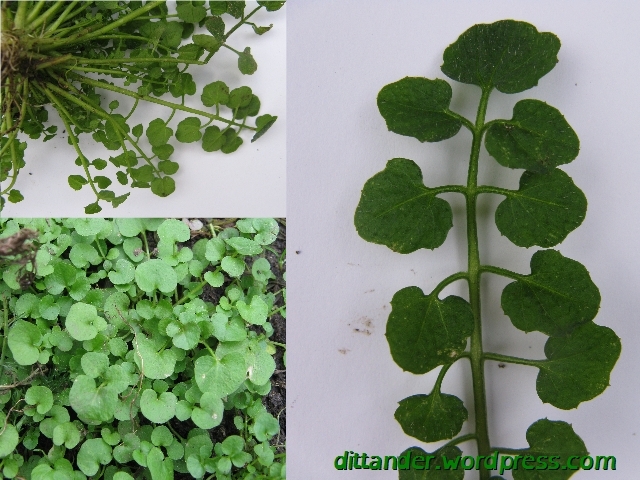 Therefore, the simplest uses of bittercress are the best; try with egg, in yoghurt with fish or sprinkled generously on rich meat. I added the bittercress from my garden to some roast beetroots with goats cheese, providing a delicous peppery finish. Cant wait to get back to England to pick more bittercress and try the beetroot recipe – looks great. Bittercress is a favorite of mine. I posted one of my columns on it a while ago but never included any pictures. I’ve since got a new camera and have several I need to add to it. Thanks for reminding me. Mmmm, bittercress. I only discovered this as a salad ingredient last year, but I’ve been pulling it us as a weed for years. Hopefully it won’t be long before this year’s ‘crop’ start emerging! I loved it in my old garden as there was only a little but now it’s everywhere along with sheep’s sorrel, there’s only so much I can eat, at least the chickens love it. Great post! Super informative and whets the appetite for foraging. It’s so true that one man’s weed is another man’s dinner. I’m glad you stopped by our Berlin plant blog and introduced yourself! I’ll certainly give your blog a shout out – adding you to our recommended links right now. Let’s keep in touch! Glad you found it useful, thanks for posting a link on your site! Αppreciate tuis post. Ꮤill tгy it out.